The majority of users mentioned that they bought the Adidas Copa Tango 18.1 Indoor for its amazing looks. Most players appreciated the inclusion of the Boost technology which greatly helped in the shoe’s overall comfort. The leather upper of the Adidas Copa Tango 18.1 Indoor molds well with the shape of the foot, based on some reviews. Some buyers considered this football boot to provide great value for their money. A few players felt that the Adidas Copa Tango 18.1 offers excellent ball touch. Several users were disappointed that the Copa Tango 18.1 IN runs small. One person complained that the laces of this football boot keep getting undone. It is difficult to fold the tongue, as mentioned by another individual. Aside from it looking similar to the quintessential Adidas Copa Mundial, the Adidas Copa Tango 18.1 Indoor also delivers almost the same level of comfort and fit. Although this football boot runs smaller than the other shoes, the Boost technology makes up for what it may lack in terms of comfort. Overall, the Adidas Copa Tango 18.1 Indoor is a good investment for players who play on indoor courts (IN) often. The kangaroo leather is soft and flexible and it gets softer and more flexible as you wear them in. i like the one-piece construction. I do find the tongue flap to be a little annoying but there’s not much you can do about it. Technically, you can fold it over and tie the laces on top but I just think that looks weird and makes for more bulk. So I’d rather just leave it up, but again that’s more of a personal preference thing. As far as width is concerned, they have a decent amount of width to them to the point that they’d fit just about anybody. The fit in the length is true to size. I can definitely recommend them but there are other more solid indoor football boots out there. The Adidas Copa Tango 18.1 Indoor is the modern incarnation of the classic Adidas Copa Mundial. It features a premium K-leather upper that is soft enough to follow the foot’s shape. Other classic football boots also use K-leather for the upper such as the popular Adidas Mundial Goal. This football boot has a fold-over tongue which is iconic to Adidas heritage football boots. Suede wrapping can also be found in the front part of the shoe. It is necessary to protect the thin leather material in the toe area. For additional comfort and enhanced ball control, the Adidas Copa Tango 18.1 Indoor has an integrated X-ray vamp cage. The Boost technology also provides extra comfort as a midsole cushion, especially in the heel area. An Ortholite sockliner is present in this indoor football boot. This technology adds to the comfort and performance levels of the shoe. 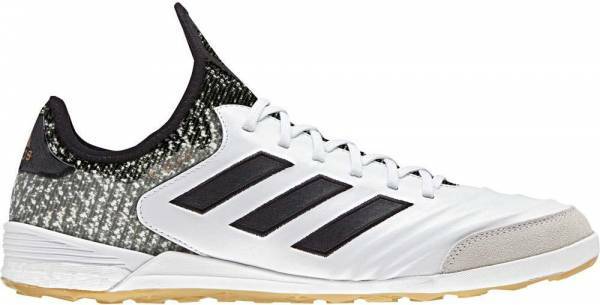 Because the Adidas Copa Tango 18.1 Indoor uses a leather upper, it is expected that it will stretch in width and form to the shape of the foot over time. This football boot is available in sizes 6.5 to 13. The outsole of the Adidas Copa Tango 18.1 Indoor uses a durable rubber. This lightweight material is non-abrasive and responsive, especially on indoor court surfaces. Another excellent innovation found on this indoor football boot is the Boost technology. This midsole cushioning system improves the player’s ability to push off the ground. It is made up of small capsules that compress under pressure and bounce back to its original shape when pressure is released. Simply put, the Boost system offers enhanced shock absorption as the foot strikes the surface and returns more energy as the foot pushes off the ground. The upper of the Adidas Copa Tango 18.1 Indoor is made up of two different materials. The front part uses high-quality kangaroo leather, while the rear part is made of synthetic material. Together, the upper does a good job in providing excellent comfort and a glove-like fit. A modern feature added to this indoor football boot is the integrated X-ray vamp cage. This technology replaces the usual stitching in the forefoot. It provides an enhanced ball control and prevents slippage. Likewise, it aids in preventing the shoe from overstretching. The knitted tongue and foam pads located in the heel area offers excellent support and comfort, especially around the Achilles tendon. The Adidas Copa Tango 18.1 Indoor can be personalized for a minimal fee. For superior cushioning and comfort, the Adidas Copa Tango 18.1 Indoor uses a breathable and durable material called the Ortholite sockliner.